Emergency department staff are warming up for the 2018 FIFA World Cup. 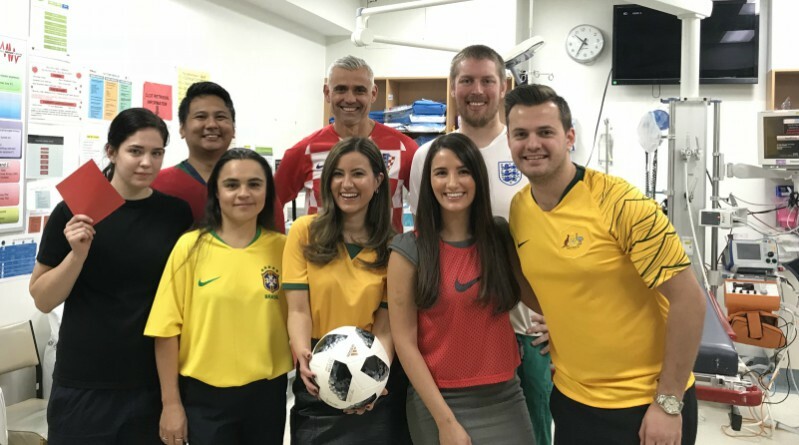 Western Sydney Local Health District (WSLHD) staff are driven, compassionate, assertive and dedicated to their profession but there is something else many are also passionate about … the FIFA World Cup! Westmead emergency department staff could not wait to put on their jerseys and line-up to cheer for their stars. To see our football video go to our Facebook page. The 2018 World Cup kicked-off in Russia yesterday with Russia thumping Saudia Arabia 5-0 in the opening match. Our Socceroos are on the world stage tomorrow night with an 8pm (AEST) kick-off against France and WSLHD will be supporting them all the way. Thank you to Rebel Sport in Parramatta for decking us out in World Cup gear! ← What makes a great Pulse story?